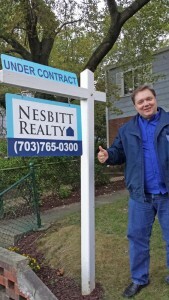 Nesbitt Realty & Property Management > Selling Real Estate in Northern Virginia > What’s the difference between a real estate broker and a real estate agent? In the Commonwealth of Virginia a real estate agent is a person who is licensed to be paid a commission on a real estate transaction. Real estate agent’s begin with a 40-hour course and then must follow up with continuing education to stay apprised of updates in real estate law. Real estate agents may not work independently and they must affiliate with a real estate broker. A real estate broker has a higher education requirement than a real estate agent. In addition a real estate broker must have 3 years of full-time work experience as an agent in order to qualify for the process of becoming a broker. Broker’s are responsible for supervising the efforts of any agents whose licenses are affiliated with them. Because the broker has a deeper understanding of real estate laws and practices, agents often come to their broker when they have questions or need assistance. There are three types of brokers: a managing broker, an associate broker and a principal broker. Every real estate firm in the Commonwealth of Virginia has a principal broker. The principal broker is the primary licensee from which all licenses at the firm are authorized. A principal broker is uniquely responsible for the actions of every affiliated agent or broker. In addition to managing the burdens of real estate law and practices, the principal broker is responsible for the actual business practices of the brokerage. At some point, a brokerage can grow too large for one broker to manage. In addition some brokerages have multiple offices. For this reason a principal broker may need to appoint managing brokers. A managing broker has all the education experience that a principal broker has, but the managing broker’s responsibilities are generally limited to the management of agents and offices. Most real estate agents at most chain brokerages report to a managing broker and only rarely interact with the principal broker. At Nesbitt Realty every agent has immediate access to and direct supervision from the principal broker. An associate broker is a broker who has fulfilled all the educational requirements to be a broker, but the associate broker does not assume a managerial position. An associate broker is affiliated with a managing or principal broker. An associate broker requires minimal supervision, the supervising broker is still responsible for the associate broker’s actions.